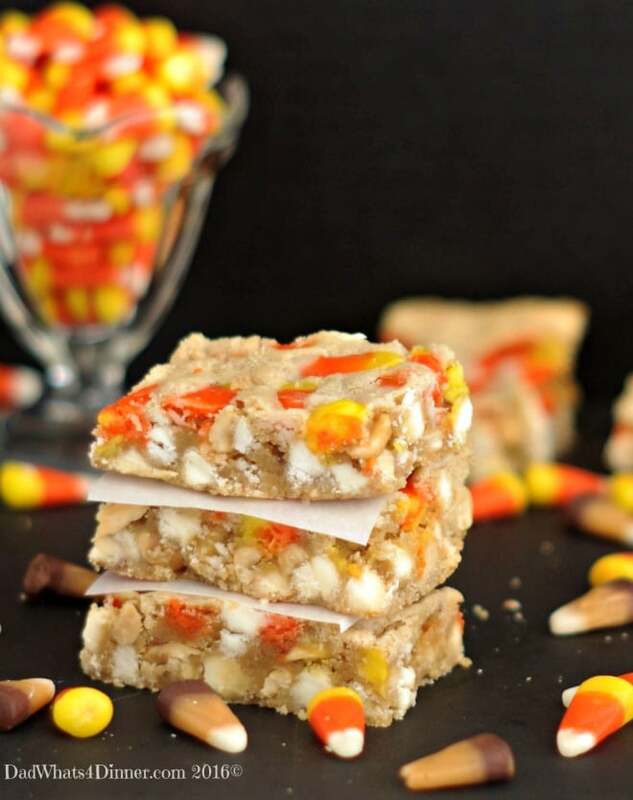 If you are craving a PAYDAY Candy Bar then you will love my Peanut Butter Candy Corn Blondie Bars. 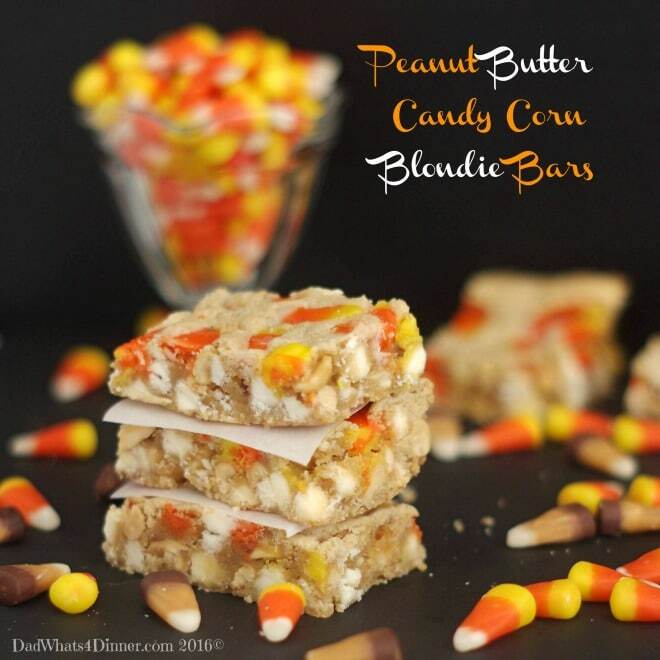 Great way to use up leftover Halloween candy. When I was a kid I was allergic to dairy so I never really acquired a sweet tooth. My dad, knowing I was allergic would sometimes bring home a Planters Peanut Bar for me as a treat. You know the one that tastes like peanut brittle. I guess that is why I am always more of a fan of the sweet and salty blend instead of just chocolate. Don’t get me wrong I like to bake sweets but I just don’t eat too much. I usually try my creations to make sure it is good and what I was trying to achieve. My other favorite candy bar is the Pay Day; nougat surround by caramel, covered in roasted peanuts. See, sweet and salty! 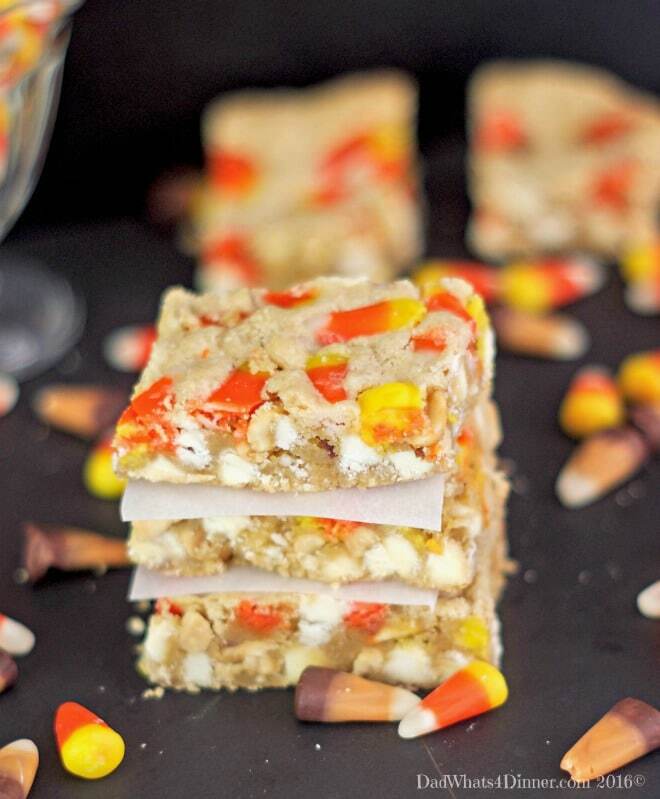 The inspiration for my Peanut Butter Candy Corn Blondie Bars was the PayDay candy bar but also the snack mix using roasted peanuts and candy corn. I love that mix and it is amazing how it tastes just like a PayDay candy. These blondies have all the same flavors in a bar form. Perfect for your upcoming Halloween party or fall bonfires. Pre-heat your oven to 350°F. Cream together butter, sugars, and peanut butter. Add in the eggs and vanilla and beat until creamy. Sift together your dry ingredients and slowly add to the mixing bowl. 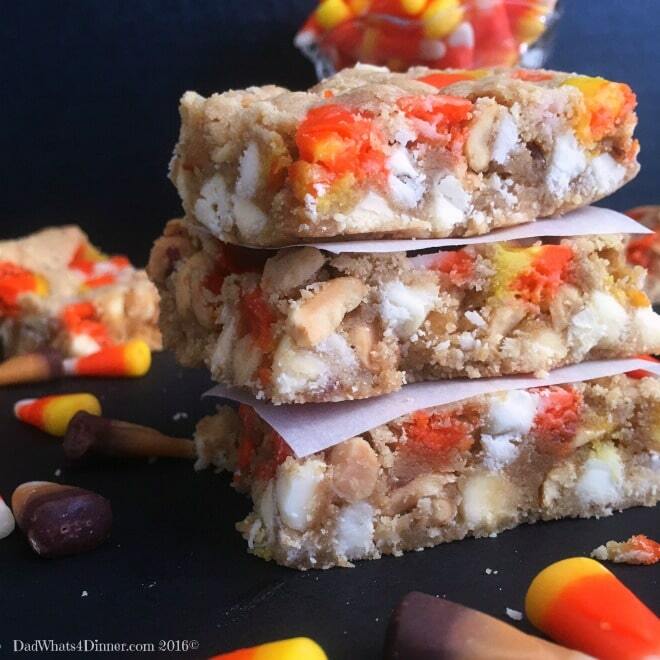 Mix in white chocolate chips, peanuts, and candy corn just until combined. Do not over-mix. Spread the mixture into a 9×13 greased baking dish and bake for 20-25 minutes. Cool completely and cut into 24 squares. 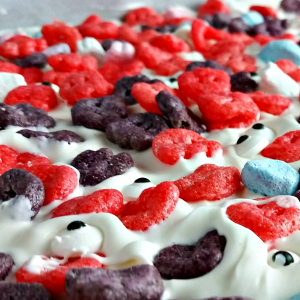 What is your favorite dessert candy bar mash-up? In a large mixing bowl, cream the butter, sugars, and peanut butter. Add the eggs one at a time and then add vanilla. Beat until creamy. In another bowl sift together the baking powder, baking soda, salt, and flour. Slowly add to the mixing bowl with motor on low. 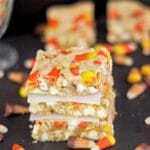 Mix in white chocolate chips, peanuts, and candy corn just until combined. Do not over-mix. Spread the mixture into a 9x13 greased baking dish. Loosely based on a recipe by Jocelyn over at Inside Bru Crew Life. 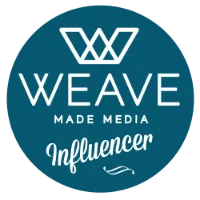 Check out her blog she has great content. 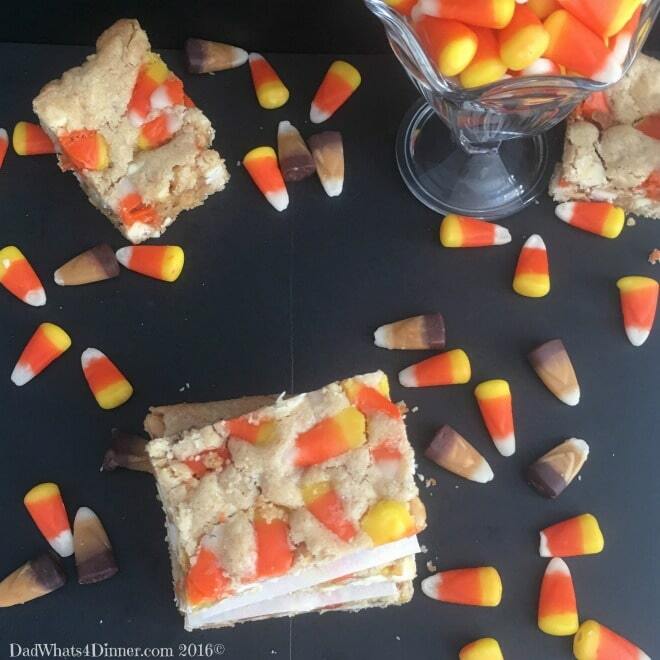 I also will be bringing my Peanut Butter Candy Corn Blondie Bars to Freedom Fridays, Friday Favorites, Fiesta Friday, Weekend Potluck, What’s Cooking Wednesdays. Check out my Link Parties page for other great places to find new recipes. 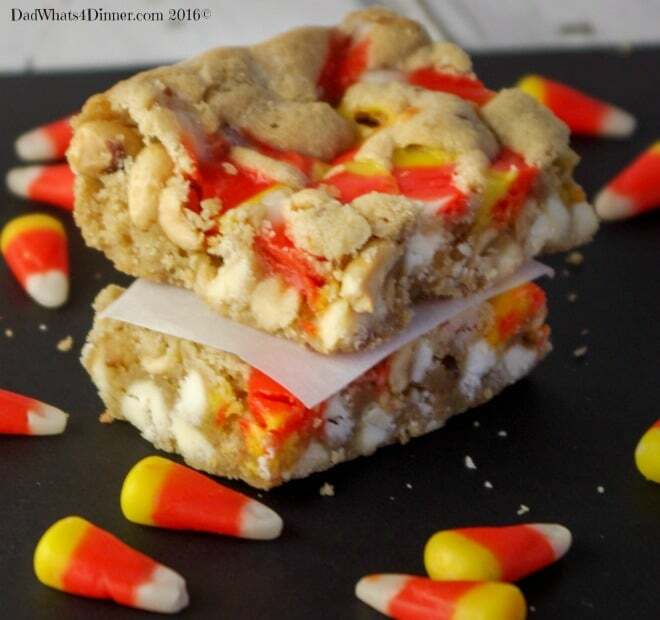 I was looking for something to bake to use up the candy corn I have. This looks perfect! Thanks Roseann. They are really good. Wow this looks yummy! I just love candy corn! They will love these bars. Thanks for stopping by. What a fun idea! I can’t wait to give these a try! YUM, I’ll take anything with peanut butter in it. I hope you’ll share this with us this week at The Crafty Corner link party. Hey Quinn! You are after my husband’s heart with this recipe! It’s the most viewed on the Funtastic Friday Link Party and it’s my feature along with one other co-host. It’s there 3 times. Way to rock out this recipe! Thanks for the triple feature. That is a first for me. Have a great weekend! I love Paydays and will definitely be trying this recipe. Thanks for sharing at Turn It Up Tuesday. 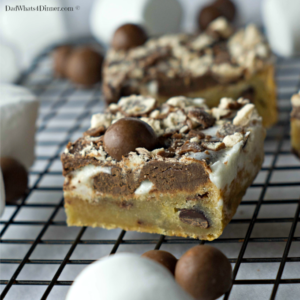 Oh my gosh – these are really good! Don’t wait to have “leftover” candy corn – go buy some now. Loved these when I made them last year!